When speaking about trends in the interior design, the farmhouse decor is the one which comes and goes regularly in time. It brings warmth and creates a nice welcoming look to your home. Vintage and rustic, the farmhouse style takes us to simpler times, where the smart technology was not invading our everyday lives and where the bath was a luxury enjoyed with a nice book and a bunch of candles. 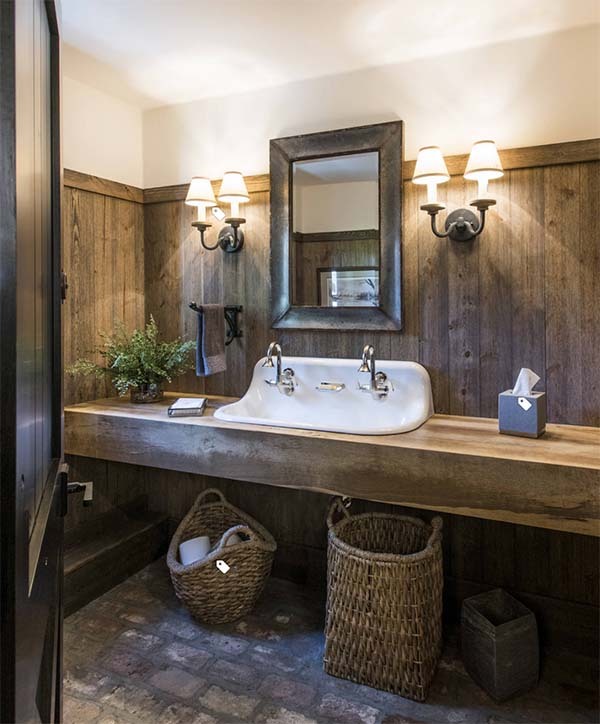 I guess this bathroom design is a way woodier than some of you would do, however, I want to attract the attention to the beautiful antique beams that make a great sink base for this small farmhouse bathroom sink by Kohler. 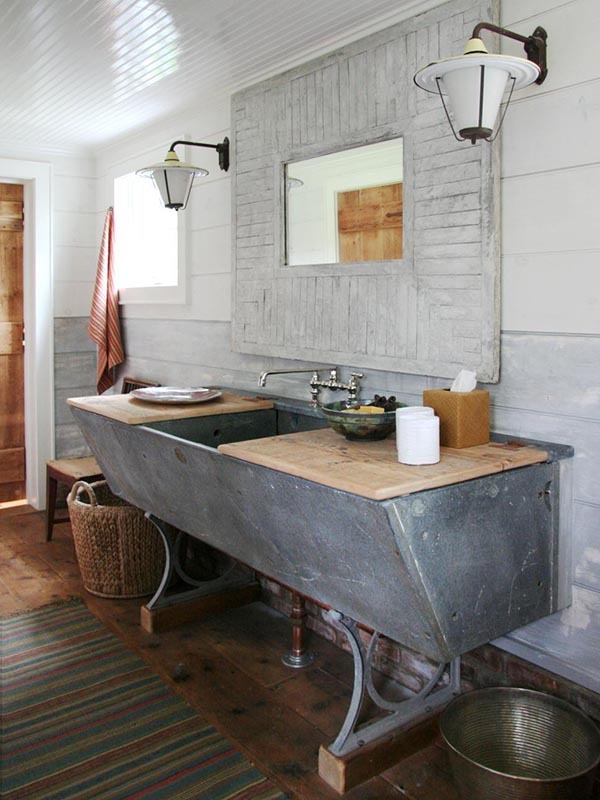 I love this chic mid-sized farmhouse brick floor bathroom idea with a cast iron farmhouse sink bathroom vanity. The room is very bright and cozy thanks to the big window and the beige wall colors. 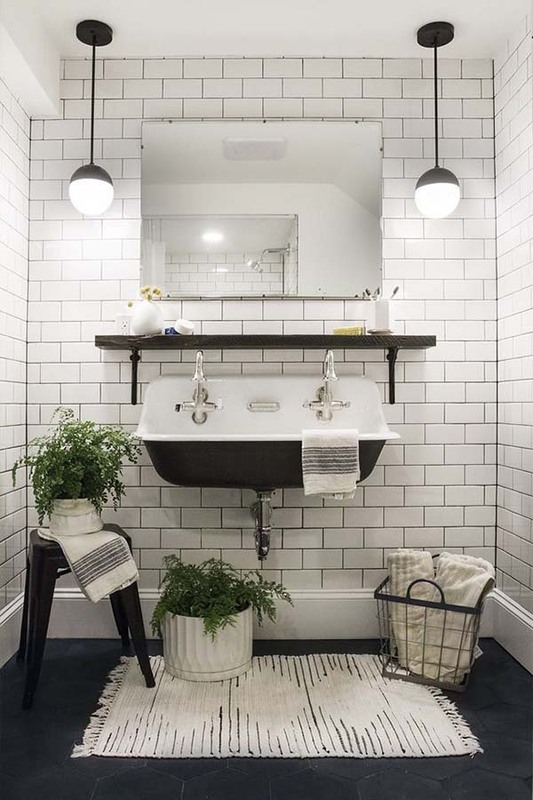 Take a look at this modern double-faucet farmhouse bathroom sink combined with white ceramic tiles, black mosaic tile floor, and lots of greenery. What caught my eyes at first place was the symmetrical balance achieved through the hanging lamps. 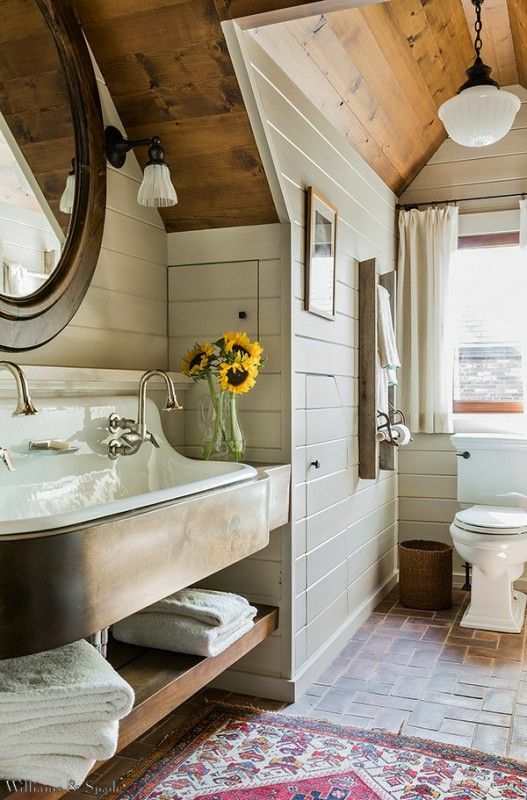 This beautiful farmhouse bathroom is made by Jennifer Worts Design Inc. 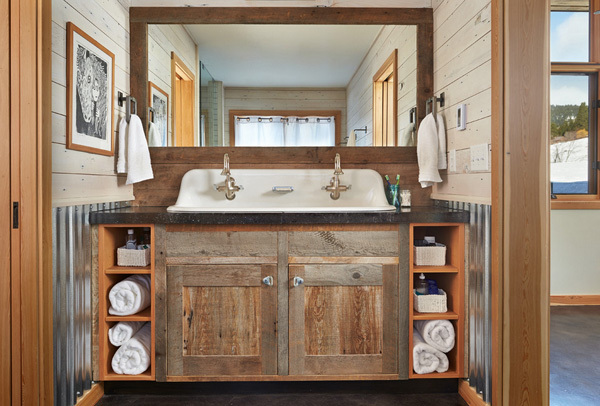 It features an upcycled timber fitted with a white trough and two exquisite goose neck faucets tucked under a wood beveled mirror lining a shiplap wall. That’s truly a piece of art, isn’t it? Believe it or not, this large concrete trough bathroom sink is 100% handmade! It takes you to a past époque in the Scandinavian countryside. The concrete is an affordable, easy-to-use material. Plus, you can create something unique that shows your own taste and style. 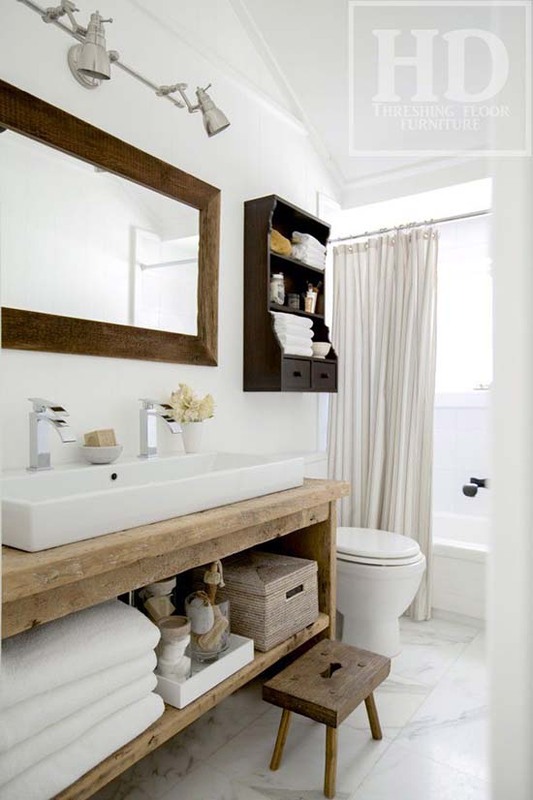 Here is an inspiration for a spacious farmhouse brick floor bathroom refurbishment with a massive medium tone wood countertop, beautiful ceramic double-faucet farmhouse sink for a bathroom, and some storage bamboo knitting baskets. I love the warmth and neutrality of this barn space. 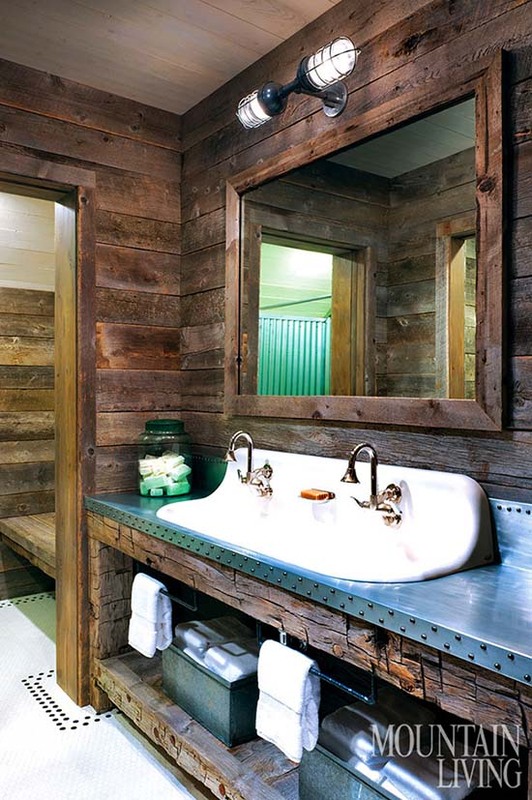 This cute wood rustic bathroom nicely combines the contemporary with the vintage. It is also very practical – with lots of storage space and the ceramic double-faucet bathroom farmhouse sink so you can share the bathroom with your significant ones. 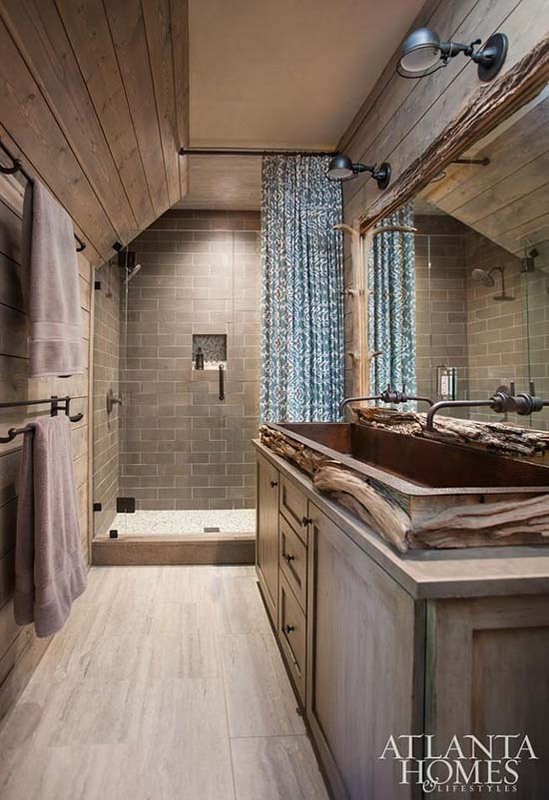 This unpretentious farmhouse bathroom, made by Williams & Spade, uses an alluring wood-and-mint green color scheme, supported by some industrial lighting and a colorful rustic carpet. But the true focus here is the double-faucet farmhouse style bathroom sink, with appropriately retro wall-mounted hardware. 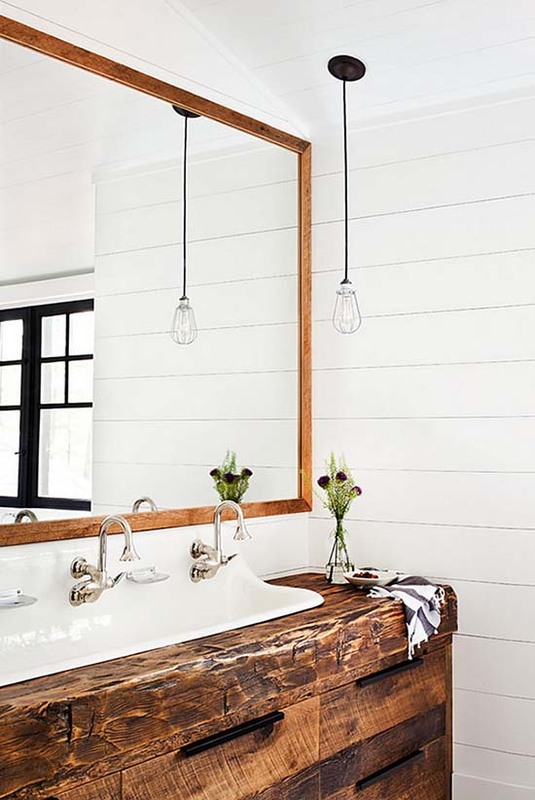 The vessel bathroom farmhouse sink with contemporary faucets, the white wall tones, and the afflicted wood touches add to the farmhouse feel, without seeming too rustic. Spanish style, with wooden accents and Mediterranean mosaic tile brown floor bathroom, features a deep-drawn stone farmhouse double trough bathroom sink with beautiful vintage faucets that finish off the look. 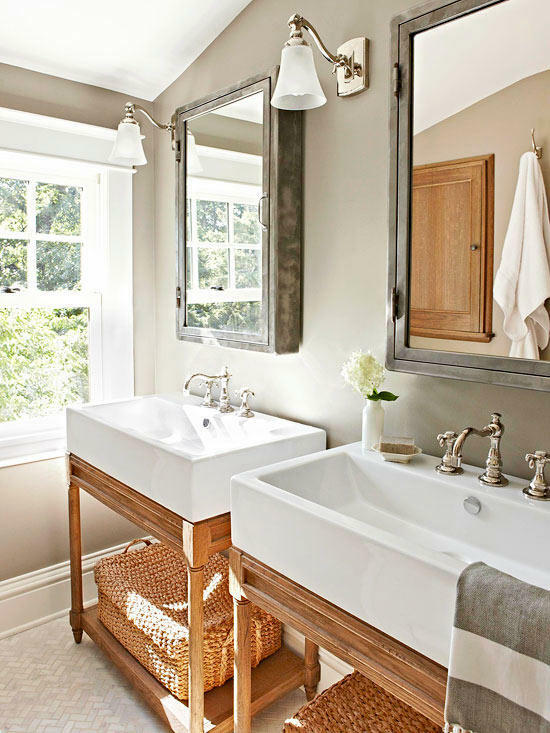 This stylish double vanity trough sink farmhouse bathroom is very bright and welcoming thanks to the radiant tones that reflect the sunlight coming from the large window. I love the delicate symmetry implemented in this design. 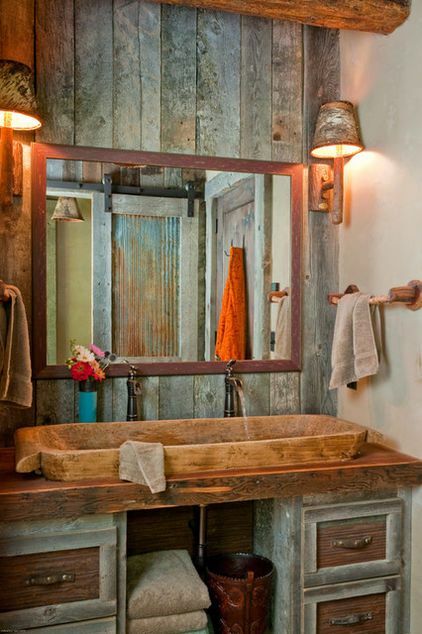 When I first saw this bathroom, I thought about my great grandmother’s farmhouse. 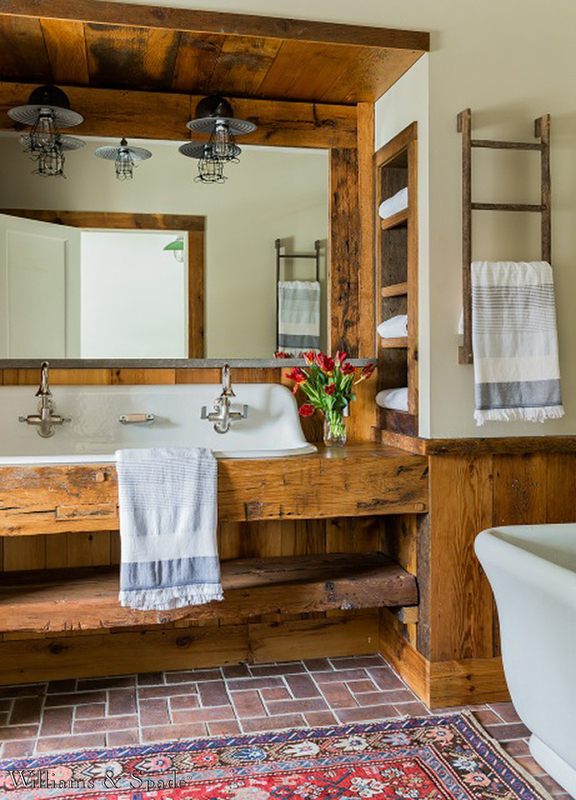 And thanks to today’s old-looking, but modern-performing hardware, toilets, tubes, and trough sinks, you can get the look and feel of a farmhouse bathroom with all the present-day practicalities. This one is also suitable for country bathroom designed area. 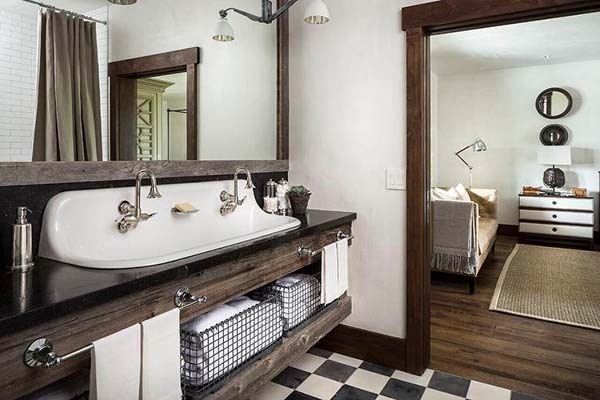 En-suite farmhouse style bathroom adorned in checkered floor tiles boasts a large upcycled wood vanity mirror holding zinc sconces over a black granite countertop accomplished with a trough sink and double polished nickel vintage gooseneck faucets. Arranged upon a redeemed wood washstand tailor-made with nickel towel bars and a shelf with identical wire storage baskets. 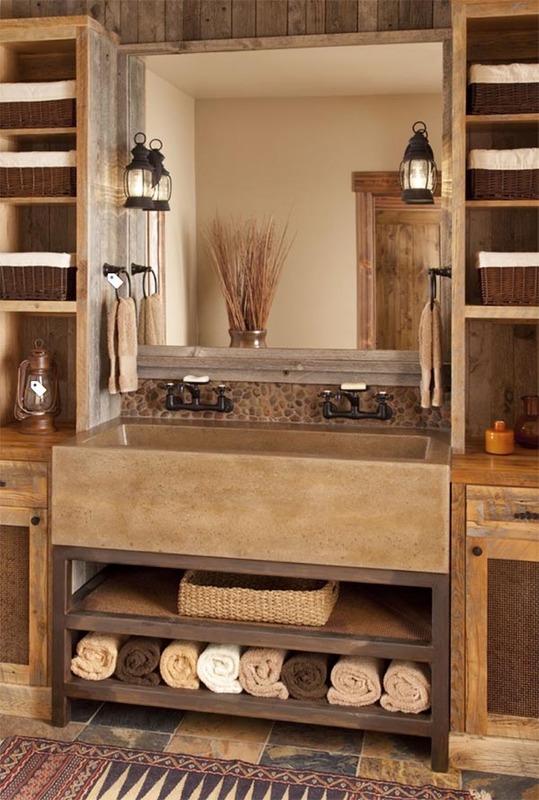 You would be able to add some dramatic look to your farmhouse bathroom using darker tones. Also, if you want to make the space unique, leaving your own style, try to implement some repurposed elements. The faucets here, for instance, are taken from a school science lab.